Incorporating elements from the rugged Defender Series with the skin-like Impact Series line to create a slick case for the Samsung Galaxy S3. In a stylish Glacier colour scheme. I did a lot of research into cases for my new Samsung Galaxy S3. I didn't want anything that flips open and I didn't want a case that looks good but doesn't offer any protection. I know that I did want something that is robust but also protects every corner of the phone aswell as the screen. So I came across the Otterbox, I must say that this is the most I have spent on a case but I am so glad I bought it. The case fits the phone perfectly and with it's hard back it feels very solid when your using it. I love the ridge on the outside so you won't scratch the screen and the free screen protection is an added bonus. If you want the best protection and are like me a little clumsy when it comes to mobile phones then this is without a doubt the best case you could purchase. Give your phone protection without the bulk! 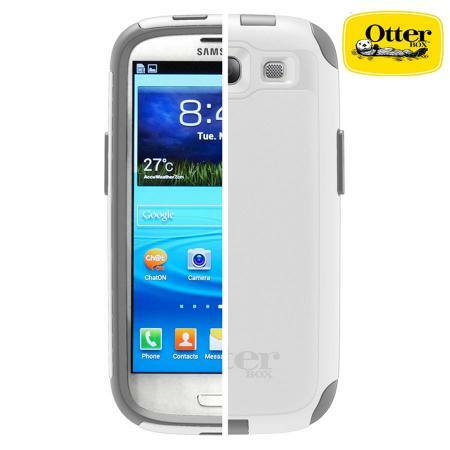 The OtterBox Commuter Series case for the Samsung Galaxy S3 offers the best of both worlds; incorporating elements from the rugged Defender Series line with the silicone, skin-like Impact Series line to create a slick case designed with your style in mind. The exposed silicone corners dissipate impact away from the device for additional bump and shock protection and the smooth outer layer allows the case to easily slide into your pocket or purse. All buttons are fully functional through the case and the audio jack and USB port are accessible through silicone plugs.